The TOURING CHOIR includes pre-high school choristers with advanced vocal and note reading ability. When a child can sing comfortably in parts, is becoming proficient in vocal technique, and shows evidence of music reading skill, he or she will be eligible for the Touring Choir. 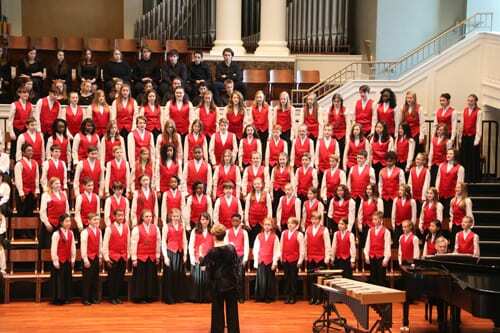 The Touring Choir literature is more difficult than repertoire performed by the Preparatory and Concert Choirs, and a greater emphasis is placed on foreign language literature, advanced vocal technique, and accelerated music reading skills. The Touring Choir performs in December and Spring concerts, takes an annual extended weekend spring tour and participates in numerous other performances throughout Middle Tennessee. Learn more about auditioning for the Touring Choir.